“Laughter Therapy” has already been successfully practiced in the U.S. for many years. 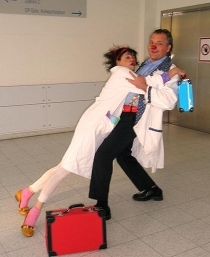 The non-profit association CliniClowns Austria has been established in 1991 in Vienna. “The clown therapy” is used in addition to conventional medicine to have a positive impact on the recovery process. Furthermore, the CliniClowns take over a catalytic function for the hospital personnel in order to brighten up the atmosphere that is often characterized by hopelessness, illness, or death. The DDr. Heinrich Foundation® bears the cost for the visits of the CliniClowns during the season of Advent in the Floridsdorf Geriatric Center. By their visits, the CliniClowns aim to give a breath of magic zest for life to geriatric patients in order to make them forget their pain and suffering for a little while.